A shelf-stable eclair! I opened up the package of frozen Rich's eclairs today and checked the instructions (ok, yes, they come with instructions) which say to thaw at room temperature for 10 minutes before eating... or that, for my convenience, they may be stored in the fridge for 14 days - or at room temperature for 7 days. 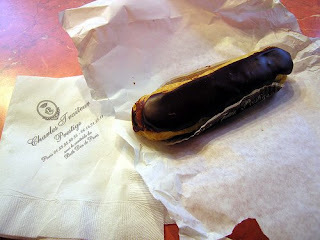 Of course, I am NOT the kind of person who can wait 10 minutes for eclair gratification - so I popped it in the microwave for 15 seconds, which did the trick nicely. For some reason, this reminded me of those microwave milkshakes they had about 20 years ago. Sounds weird, right? But I guess the milkshake came completely frozen solid, and you were supposed to microwave it a BIT - not until it got hot, I suppose - and then shake it around to make it drinkable. To me, that seems a bit weird and kind of onerous, which is, I guess, why the shelf-stable and/or refrigerator-section milkshake beverage has prevailed. You never see microwave milkshakes anymore.